Yet another ‘museum’ is upon us: will the Maritime Experiential Museum be more than a gimmick? 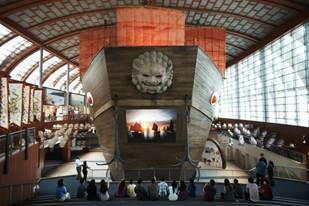 Click ‘here‘ to see the press release of the new museum – Maritime Experiential Museum (MEM) – in Sentosa which is set to open in Oct 2011. Scrutinise it. You’ll see that for a new ‘museum’, the director of the museum and its curators have no voice in it whatsoever. The first name mentioned that is related to its contents/display is Ralph Appelbaum, who owns Ralph Appelbaum Associates from New York, who designs museums. With this, I take it to mean that the museum is a ‘design-led’ one, where academic integrity takes a back seat so that all the bells and whistles of a new ‘edutainment’ museum dazzle the visitors instead. How can the press release of a new museum not contain at least a quote from its chief curator??? Want another clue why this new ‘museum’ is likely to be a place of ‘entertainment’ rather than ‘museology’? There’s no mention in the release about any ‘authentic old artefacts’ on display at all. Instead, its raves about the replica of Cheng Ho’s ship, dioramas of marketplaces around the world and musical instruments you can play ‘online’; i.e. all the key displays are ‘designed’, not excavated from the seas nor bought from auction houses nor borrowed from established museums. Call this new ‘museum’ whatever you want, but please don’t splash the title ‘museum’ on it! Just like the ‘Artscience Museum’ I had blogged about, museums should have permanent collections of ‘real’ artefacts; you can’t really be a ‘museum’ if you display only replicas and/or temporary exhibitions. Perhaps I see a pattern; both MEM and Artscience are housed in casinos, and academic integrity does not seem to feature highly in such a setting. But at least MEM has got one thing right; the pricing. While Artscience launched itself with $30/adult tickets (which it later on has reduced…), MEM is only charging $5/adult only so that it saves itself some face from an embarrassing price-cut after a year of poor attendance. Watch this space for a review soon! Latest update: Based on a ST report today (7 Oct 2011), the Museum does have 100+ shipwreck-artefacts on display. Apparently, they have also 2 other sets of similar artefacts for rotation. And finally, John Miksic, Singapore’s most established archaeologist has been named as part of the Museum’s research efforts. Let’s see if this museum can rise above the gimmicks of technology and become a respectable one where academic information is generated and shared.